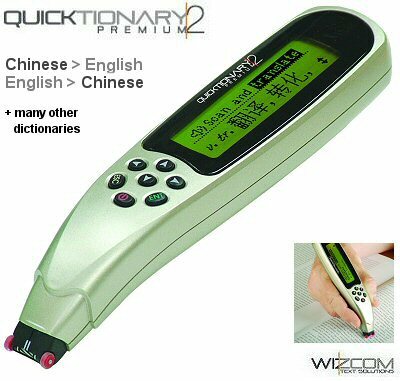 The Chinese Quicktionary 2 Premium, also known as the Chinese SuperPen, is a portable, multi-function, hand-held scanning translator that can scan a word or a full line of text and provide immediate word-by-word translation, including idioms and phrases. The pen provides audio pronunciation of individual words or full lines of text in English. The Chinese Quicktionary®2 Premium comes with free space on its memory card for maximum flexibility. This allows you to add additional FREE dictionaries or replace installed dictionaries at your convenience. The Chinese Quicktionary®2 Premium also has the ability to scan, store and transfer up to 20,000 lines of editable text. Ideal for language students, students who need to read and/or copy texts, travelers, researchers, business people and others. Instructions and software are included with the pen are provided in both English and Chinese. We also sell the Standard Quicktionary 2 Premium Pen (Super Pen), that is the same, yet without the pre-installed Chinese dictionaries. Translates Chinese Characters into English. Translates many other languages too! Transfer editable text to your PC! Fully PORTABLE, fits in your pocket! Portable hand-held scanning device for scanning, TRANSLATING, storing and transferring printed text to a PC, PDA or Smartphone. This completely mobile Pen can scan up to 20,000 lines (500 pages) of text at a time, offering a quick and easy way to take notes, creating text that is fully editable in Windows applications. Chinese Dictionaries: The Chinese dictionaries are pre-loaded onto the pen. These dictionaries use the official Chinese characters of the People' Republic of China, Singapore, Malaysia and the United Nations., known as Simplified Chinese. Stay focused on your reading while the Chinese Quicktionary®2 Premium Translation feature helps you interpret your text quickly and easily. Scan up to 20,000 lines of editable text, store it on your pen and transfer it directly into any Windows based application on your PC, PDA or Smartphone at your convenience. Expand your vocabulary in any one of over 45 supported dictionaries. Take the Chinese Quicktionary®2 Premium wherever you go. This small, portable, handheld device is designed to fit in your pocket. The Quicktionary Premium is an ideal tool for students, researchers and business people who need to scan data even when they are away from their computers. The fully portable Quicktionary Premium is equipped to store large amounts of scanned text which can be transferred to the computer when convenient. It can also be used to scan text directly into any Windows-based application. Instructions and software are included with the pen are provided in both English and Chinese. Over 300,000 words and expressions per dictionary. 2 way dictionaries available are: English-English, Spanish-Eng, French-Eng, German-Eng, Italian-Eng, English-Dutch, Portuguese-Eng, Turkish-English, German-French, German-Spanish. 1 way dictionaries: (English to) Japanese, Chinese (Traditional and Simplified), Korean, Russian, Danish, Swedish, Finnish, Norwegian, Hebrew, Arabic, Czech, Slovenian, Hungarian, Polish and Greek. Available free space enabling installation of additional scanning applications, interface languages and spellers for enhanced character recognition. IR or USB connectivity enabling transfer of data to PC, Palm/PDA or Smartphone. Manual insertion of words using the Opticard or Character Bar.